Do you want to rank your local business in Google, Bing, Apple Maps, and other local search engines? You’re in the right place. Yet 56% of local retailers haven’t even claimed their Google My Business listing. 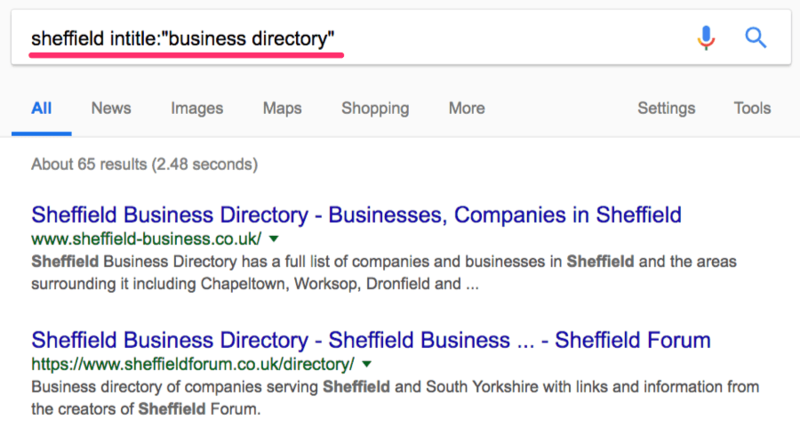 An unclaimed Google My Business listing, indicated by the “Own this business?” link in the Knowledge Graph result. But while claiming your Google My Business listing is a good starting point, there’s MUCH more to local SEO than that. This 6‐part actionable guide tackles the lot… from start‐to‐finish. Prefer video? You’re in luck! That last point is an important one—this isn’t just about Google. People search for local businesses using various search engines… Google, Bing, Yelp, Apple Maps, etc. 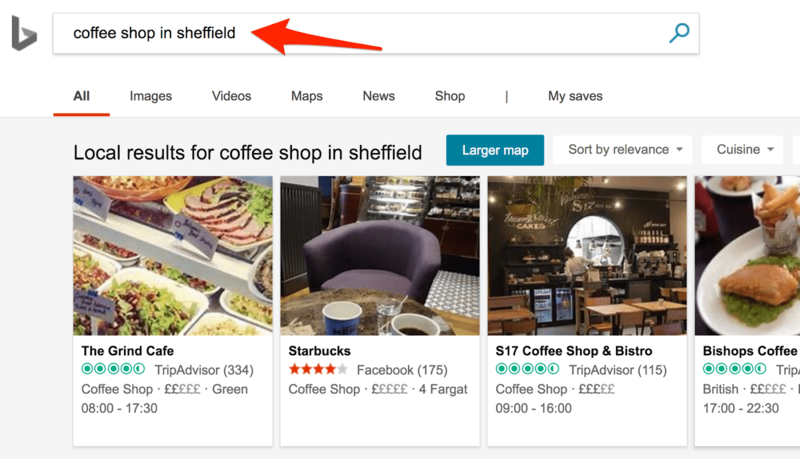 Bing’s “Local results” for “coffee shop in Sheffield” — one of the many places people search for local businesses online. However, Google has an estimated ~87% market share (in the US, at least). Which means that most people are using Google to search for local businesses. For that reason, this guide will be roughly 80% focussed on optimizing your local presence on Google. Writing blog posts is hard… I need a coffee. I’m sure most of you are familiar with regular ol’ Google search results. But what the heck are “snack pack” results? 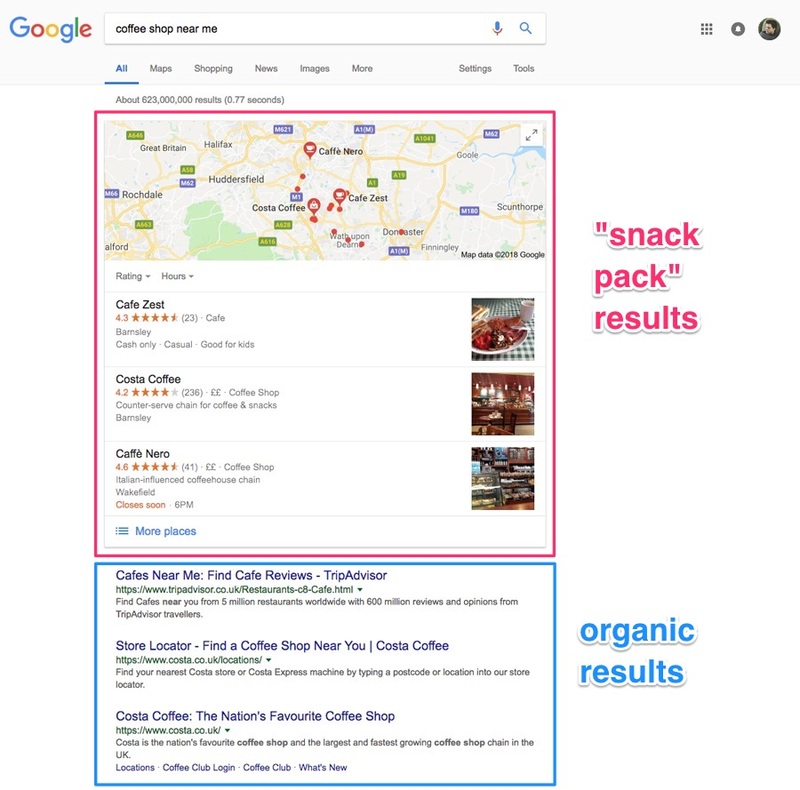 According to one study, 33% of clicks go to the local “snack pack” results, with 40% going to the regular organic results. 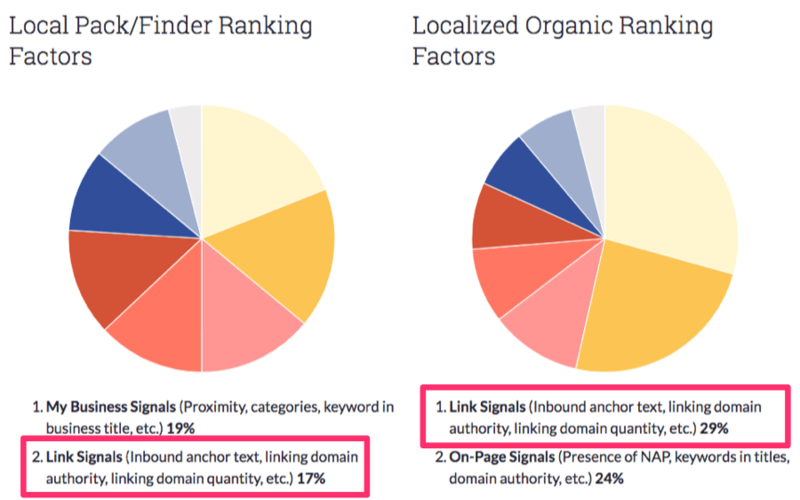 Key takeaway: it pays to rank in both, which is where local SEO comes in. Don’t forget that local Google searches are performed from many different devices and apps. You need to get the basics right. That means making sure that your website is optimized for mobile visitors, as 61% of mobile searchers are more likely to contact a local business if they have a mobile‐friendly site. Use Google’s Mobile‐Friendly Test tool to check this. Performing a mobile‐friendly test for the Ahrefs Blog. It passed. You also need to make sure that your website doesn’t look like total garbage. It doesn’t matter where you rank, nobody is going to make contact when you have a website this ugly. Lastly, I recommend making a note of your businesses current and past name(s), address(es), phone number(s), and website(s) in this spreadsheet. Let’s say that you run a local coffee shop—it’s called Déjà Brew. “what time does Déjà Brew close? But these aren’t traditional queries, because Google displays this information in card‐like results in the SERPs. Google pulls such information from Google My Business listings. But what about the more “traditional” keywords? How do you find out what they are and what you should be optimizing your site for? Local keyword research isn’t rocket science. For most businesses, the primary keywords to target will be quite obvious. Did you spot the format? It’s service in location (SiL). Doing this is easy. Just make a list of all the services you offer and the locations you serve… then merge them together to create a bunch of potential keywords. Make sure to list out plurals and variations of your services. E.g., “plumber in sheffield” → “plumbers in sheffield” → “plumbing in sheffield,” etc. Here’s a cool tool to help with that. If you’re an Ahrefs user, you can then copy‐paste these into Keywords Explorer to see the search volumes (and other metrics) for each keyword. Are you doing local SEO for a business based in a small town? There may not be enough actual searches for us to display accurate search volumes. 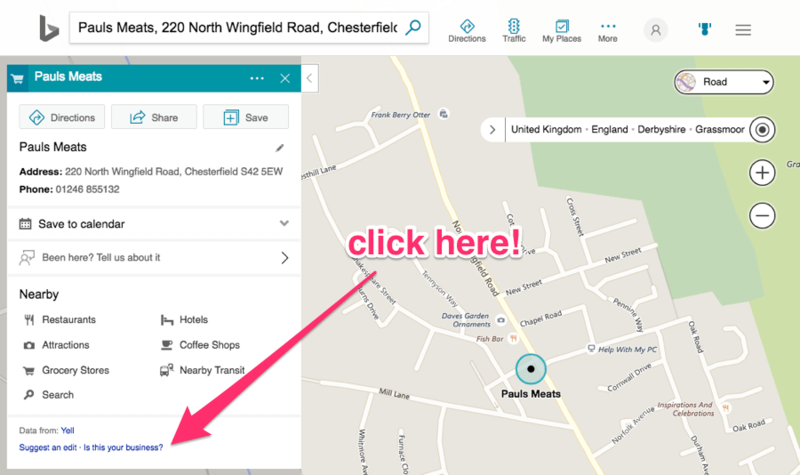 Swap out your location modifier (e.g., “Sheffield”) for a larger, nearby city (e.g., London). You should see search volumes for this location. FYI, you can usually find population data just by Googling it. 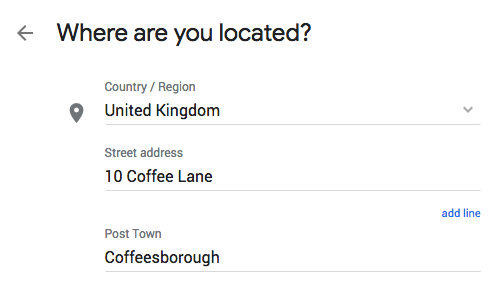 Let’s see if we can reverse engineer a rough search volume for “coffee shop sheffield” from our knowledge that “coffee shop london” has approximately 900 monthly searches. Not too far off—the true search volume is 90. NOTE. This will only provide an estimate. But if you use the same nearby city in your calculations for any keyword, you will be able to get a sense of the relative search volumes, which is what really matters. Craigslist’s can be a goldmine when it comes to finding local keyword ideas. Just go to their services section, select your location and enter a keyword. Let’s search for “plumber” in New York. Are you in the UK? Try Gumtree instead. Next up—use Google Autocomplete to generate more search suggestions. This is easy. Just enter your primary keyword into Google and take note of the suggested searches. There’s some interesting suggestions here—I didn’t think of ”city centre” and “train station” during my initial brainstorm of locations. Make a note of any that seem relevant. You can then rinse and repeat this process for other locations or keyword variations you have. If you’re an Ahrefs user, you can bypass this whole process by using the Search Suggestions report in Keywords Explorer. It contains scraped Google Autocomplete suggestions for the terms you enter. Search Suggestions report in Ahrefs Keywords Explorer. This saves a lot of time, as there’s no need to do this manually using Google. Google is very good at understanding search intent, which is probably why the average #1 ranking page will also rank in the top10 for nearly 1,000 other relevant keywords (according to our study). 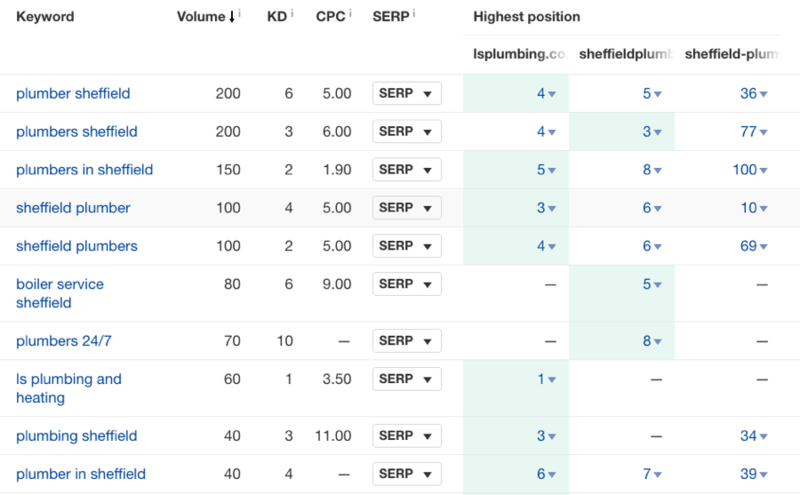 For example, when I look at the Organic Keywords report in Site Explorer for a local Sheffield plumbers website, I can see that they rank in the top 10 for a bunch of related terms. Looking at the these keywords for your competitors will uncover other relevant long‐tail and related searches. Use Ahrefs Content Gap tool to see extract common keywords for multiple competitors at once. Do this for similar businesses in other, larger areas (e.g., a big city) to uncover keywords that may also be relevant in your area, which your local competitors may have missed. 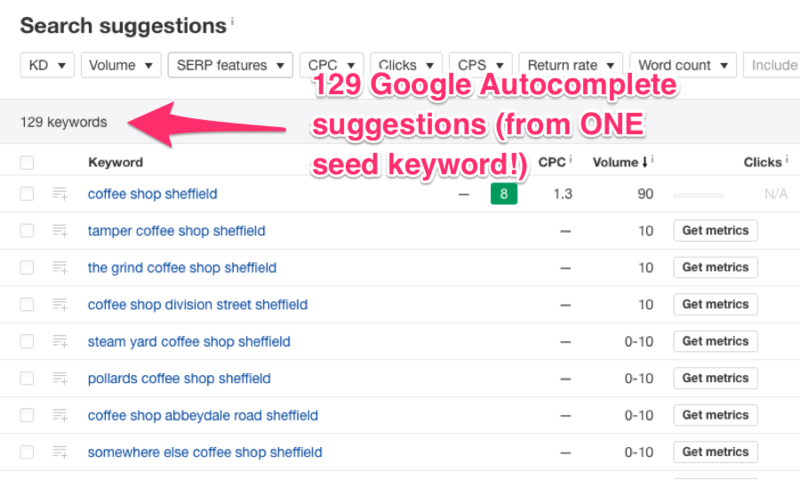 Neither of these variations come up for local competitors, so there may be some low‐hanging fruit in the Sheffield variations of these keywords. I.e., “blocked drains sheffield,” etc. 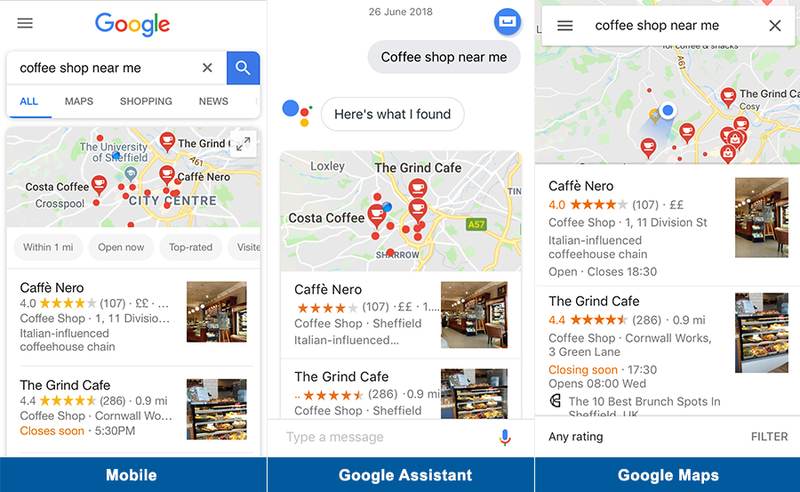 Claiming and optimizing your Google My Business listing is arguably the most important part of local SEO, although Bing Places and Apple Maps listings are important too. Setting these up isn’t too difficult—you just follow the instructions offered by Google/Bing/Apple. But with GMB in particular, there are a few things that tend to trip business owners up. That’s why I’ve included a full walkthrough below. To set it up, go here, then follow these steps. Google will first ask for your business name. Start typing, and Google will search for your business in their system. You’ll see it if they have it. Hit the option to “create a business with this name” if not. Do NOT try to shoehorn keywords here. Enter your business name, and your business name ONLY. For example, if you run a coffee shop in New York called Déjà Brew, then enter Déjà Brew as your business name. Do NOT enter something like Déjà Brew New York Coffee Shop—this is against Google My Business guidelines. Next, Google will ask for your address. If you’re claiming a business that Google already has in their system, this will be prefilled. Otherwise, you will need to enter your address. If you have a brick‐and‐mortar business with a storefront, this is easy—just enter your shop address. Your business is mobile (e.g., food truck). You have one or more offices. You have a virtual office, but no real physical location. You serve customers at a physical location AND remotely (e.g., a takeaway). If you have a real physical office, use that address. If you (and one or more business partners) work from home, list the home address of the person closest to the primary area your business serves. If you have only a virtual office, DO NOT use this address—not unless this office is “staffed during business hours.” Doing so is against GMB guidelines. Use your home address instead. Remember, consistency is key here, so I suggest copy‐pasting the information from the spreadsheet you created earlier to ensure that this is both correct and consistent with the information on your website (and any other business listings you may have). Claiming an existing listing? Double check the information Google has against the info in your spreadsheet. Update if necessary. Ticking this will indicate that you are a “Service‐area business” in Google’s eyes. Basically, you should tick this box if you do, in fact, deliver goods and services to your customers… even if you also serve customers at a physical location (e.g., a restaurant with a takeaway). Ticking this means that while Google will know the location of your business (for verification purposes), they won’t show your address to regular ol’ Googlers. It will remain private and unlisted on your GMB page. I recommend checking this box if you listed a home address. The next screen will show a map with a location pin. You can drag and move this around to pinpoint your exact business location. 9 times out of 10, you can trust Google on this. But if it looks like the pin is inaccurately placed, do feel free to move it. Google only lets you choose one category when setting up your Google My Business profile. They have a ton of advice about how to choose the correct category here. Think about what your business IS, then start typing that into the category field. Google will start suggesting categories as you type. Not sure what category to choose? Let’s say that you run shot blasting business in London. If you enter this into GMB, it will return no category results. However, try searching for “shot blasting [location]” in Google Maps. You will see which primary category your competitors chose. You can then steal their category. This one is pretty straightforward—just enter your phone number and website URL. Here’s some advice from Google. Remember to be consistent. Use the data from your spreadsheet! Before your GMB listing goes live, you will need to verify your listing. This is usually done via phone or postcard—just follow the instructions from Google to verify. 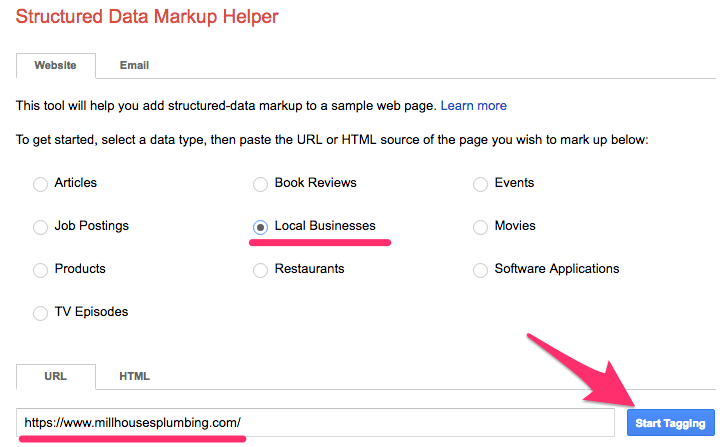 Here’s a great guide to fully‐optimizing your Google My Business listing. I recommend checking it out. This is essentially just Bing’s equivalent of Google My Business. Is it as important as GMB? No, not at all. Bing only has a 7.81% market share in the US. Which means it’s about 1/10th as important as completing your GMB profile. But as it only takes a few minutes to set up your profile, it’s still something you should do. STEP 0. Check That You’re Not Already Listed! First up—make sure your business is not already listed on Bing Places. To do this, go to Bing Maps and start typing your business name in the search bar. If you’re already listed, you should see your business appear in the live search results. Let’s try this for Paul’s Meats—a stunning butcher’s shop near my old house. Looks like he’s already listed. You will then be redirected to a page where you can claim/add your business—it will be partially pre‐filled. Next up—select your business type and location. For the purpose of this guide, I’ll assume that you’re a small business with 1–10 locations. If you do run a chain business, hit option #2—Bing will walk you through what you need to do. Online businesses (option #3) aren’t eligible for Bing Places listings, so you’re out of luck if you fall under that bracket. But then again, why are you reading this guide if you’re not running a local business!? So let’s hit option #1. 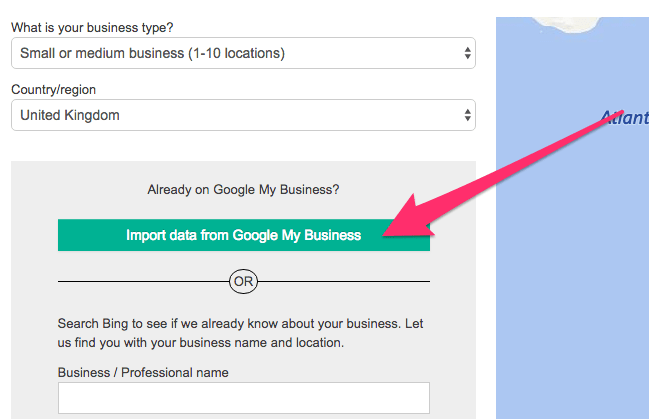 Now something magical will happen—there will be an option to import data from Google My Business. If you’re already verified on GMB, do this. Not only is it a time‐saver, but it will also reduce the probability of mistakes. If not, enter your business name and location (I recommend entering a ZIP code) as normal. Bing will then search for your business. But as we already checked this in step #0, it shouldn’t find it. So hit the “Create new business” button. Now you will need to enter your business name, address, website, etc. If you imported your data via Google My Business, this should already be done for you. As with the Google My Business listing, you should copy‐paste the data from your spreadsheet to ensure that it remains consistent with other listings. There’s also the option to hide your address from the search results. You should check this box if you work from home or use a virtual office. First things first, if you’re a “healthcare professional or doctor,” tick the special box—that’s you done for the “business segment” part. Otherwise, hit the “browse” button and select one of the 11 available business segments. Select “I don’t know” if you’re unsure. Then choose the category/categories that your business falls into. Bing’s list isn’t as extensive as Google’s. But unlike Google, you can choose multiple categories (up to 10) here and then select a “primary” category later in the process. I recommend hitting “browse” to bring up a modal window, then searching for an appropriate business category there. It displays categories and subcategories in a more logical manner. Don’t go crazy here. Just because you can select 10 doesn’t mean that you should—just pick the ones that are truly appropriate for your business. This is usually one or two categories, in my experience. You can then select a primary category from the categories you selected. Finally, add a short description for your business—sprinkle your keywords throughout, but don’t overdo it. Paste in your phone number from your spreadsheet—again, this ensures things stay consistent. Bing also displays social profile links in their Knowledge Graph panel (or whatever Bing calls it) when people search for your business. So if you have them, add them. If not, you can always add them at a later date. Here are Bing’s guidelines for photos. You can add up to 10. Apple’s iPhone has a 32.9% market share in the US—that’s ⅓ of all smartphone users, or tens of millions of people. Now, if you’re anything like me, you probably use Google Maps over Apple Maps. Millions of iOS users still use Apple Maps, as it’s the default maps application on iPhone. Apple is pretty secretive, so I couldn’t find any up‐to‐date stats on the number of iOS users who use Apple Maps. But, as it’s the default maps application on iPhone, I’d be willing to bet that it’s the majority of iOS users, which is millions of people. Apple Maps is built into Siri and Spotlight searches. Ask Siri for directions and Apple Maps will open. Same goes for Spotlight searches. Latest stats show Siri is actively used on more than half a billion devices. That’s a lot of people! Bottomline: if you’re doing local SEO, you should claim and optimize your Apple Maps listing. You can do that here. Then follow this guide to optimize your listing. Citations are online mentions of your business, which usually display your business name, address, and phone number—collectively known as NAP (Name, Address, Phone). Many SEOs refer to citations that don’t display full NAP information as partial citations. Some also talk about UNAP/NAPU (Name, Address, Phone Number, URL) and NAPW (Name, Address, Phone Number, Website). There are two main types of citations: structured and unstructured. Structured NAP citation for The Hallamshire House, from their Facebook page. Basically, structured citations are those where NAP information is presented in a visually‐structured manner. They usually reside on business directories, social profiles, etc. The Hallamshire House, Sheffield, cited in a blog post about Sheffield pubs. Unstructured citations are mentions of your business that in an unstructured format (surprising, right!?). These usually reside in blog posts, on newspaper websites, on business blogs, etc. According to Moz, citation signals are one of the top local ranking factors. This is true for both Google’s “snack pack” results and regular organic search results. Most likely, this is because consistent NAP information across the web serves to further verify the data Google has on file (GMB) for a particular business. Inconsistent NAP information, on the other hand, serves only to confuse, mislead and misdirect both Google and potential customers. This leads to a poor user-experience—not something Google is a fan of. Google isn’t the only place people search for businesses. They also search via Facebook, directories, etc. Having an accurate NAP listed on those sites will allow potential customers to find your business, which translates into more customers and revenue. Make sure existing citations are correct and consistent. Let’s explore how to do that. Most businesses will have some existing citations. But more often than not, at least some of these will be incorrect and/or incomplete. Some will have the correct business name and address, but the wrong phone number. Others will have the correct business name and phone number, but an old address. And some may have partial information—e.g., business name, address, but no phone number at all. 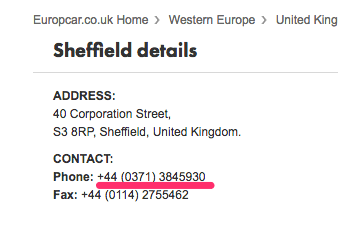 For example, Europcar Sheffield displays their phone number as +44 (0371) 3845930 on their website. But their Yelp listing shows 0871 384 5930. This is a perfect example of inconsistent NAP information across the web—and something that should be corrected. I should point out that both of these numbers actually work, but for NAP citation purposes, it’s better to choose one number and stick to it. This will ensure consistency across all structured NAP citations, at least. Go here and search for your business. Moz will check the main data aggregators in your country and uncover any incomplete, inconsistent, and duplicate listings. It’s looks like the phone number is the culprit here. They each display the 0871 version rather than the 0371 number listed on their official site. To fix these, click through, claim the listing (if you haven’t done so already), then update. Most smaller directories obtain your businesses NAP information from data aggregators/suppliers. Neustar Localeze—search their directory for your business, then request to manage the listing if you haven’t done so already. Not listed? Add your business here. Checking your listings on these sites allows you to potentially update tens or hundreds of inconsistent/inaccurate NAP citations in one fell swoop. Use a paid service like BrightLocal to supply data to many of these data aggregators in one go. Fixing any issues with the major data aggregators won’t clean up all citations. You will almost certainly still have some inconsistent, incorrect or incomplete data out there. The only way to clean up this data is to perform a manual citation audit and cleanup. The basic process for this is to search Google for such citations with advanced search operators. Having looked at some other listings on this site (example), I know that the phone number is usually displayed below the address. It’s missing from this listing. I don’t see this phone number on the Europcar website, so it would probably be better to change this to the 0371 number (if possible). 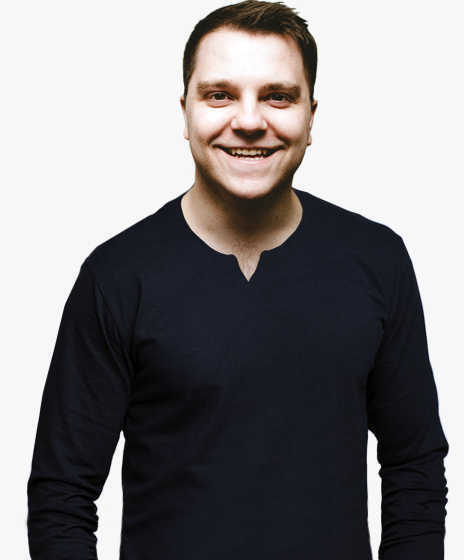 Casey Meraz, founder of Juris Digital, wrote an excellent post for Moz that goes much deeper into the manual citation audit process. I recommend that you check it out. Now that you’ve found and fixed existing citations, it’s time to build even more. I recommend starting with some core structured citations. Here’s a list of 50 to get you started. Not in the US? See a list of the top citation sources for your country here. Basically, just look for any online publications related to your industry. Whitespark’s local citation finder tool finds opportunities based on your location and keyphrase. 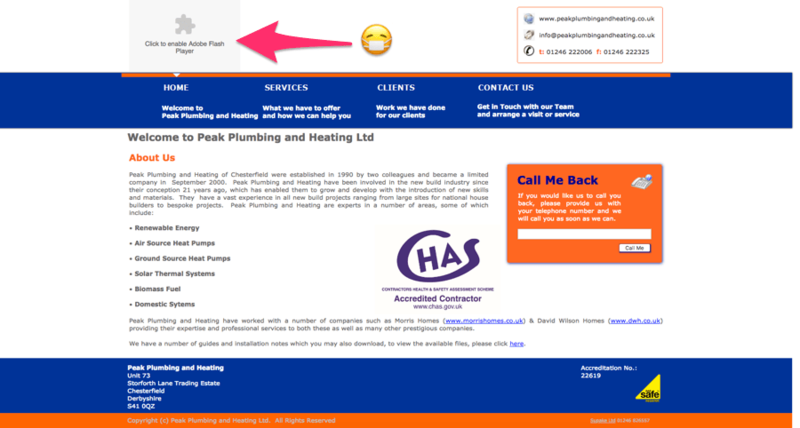 Just enter your location and some keywords related to your business (e.g., plumber). The tool will do the heavy lifting for you. For this search, it found 110 potential citation opportunities. It’s then just a case of creating listings on any relevant sites. You can easily outsource this task to a VA too. Whitespark is a freemium tool. The bulk of the results will be blurred out unless you’re a paying member. But it’s still possible to find some decent opportunities, even with a free account. Generic anchors like these often come from directories. 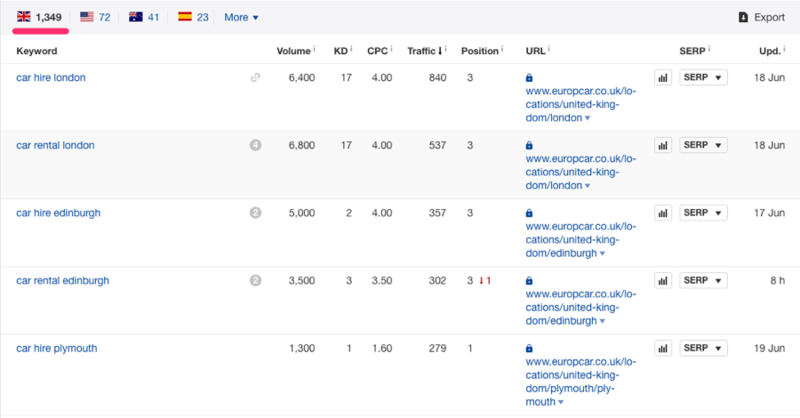 You will now see a list of similar sites that compete with you in the SERPs. 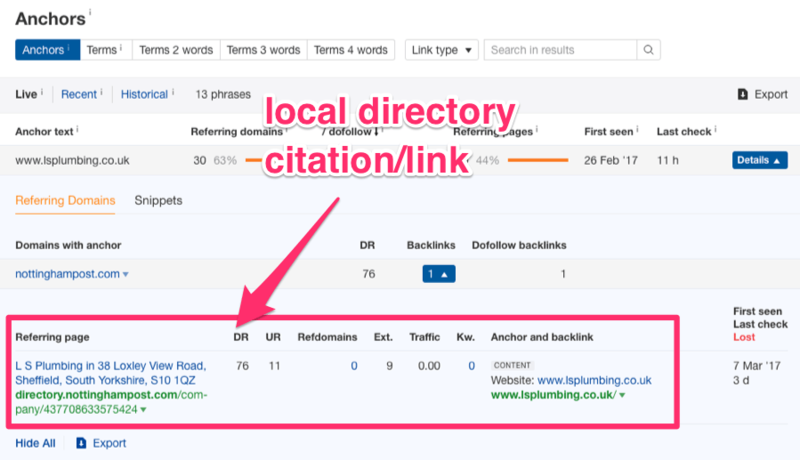 You can also use the Backlinks report and filter for nofollow links only—these are also often directories. Copy‐paste some of the top‐ranking websites into our Link Intersect tool. Paste your site in the “But doesn’t link to (optional)” field. NOTE. Make sure they’re actual business websites, not directories. You will now see which sites are linking to one or more of your competitors. In this case, ManchesterEveningNews.co.uk is linking to ¾ of the competitors I entered—this is clearly a directory. Remember, we know that each of these sites rank in the top 10 for our target keywords. So it’s reasonable to assume that any common citations/links these sites have are helping them to rank. And if that’s the case, it will probably pay to get listed on these sites too. Check out section #2 from this guide for more relevant search operators. But there are a few other things to keep when trying to rank locally, like displaying NAP information and adding relevant schema markup. There are also differences in approach depending on the number of locations you serve. If you serve multiple areas/cities and want to rank in each of those locations, you need to set up local landing pages. Want to see a business doing this extremely well? Check out Europcar. 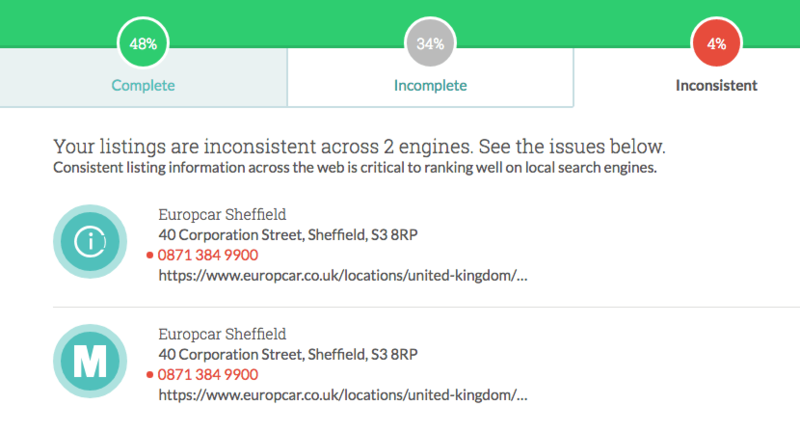 Europcar’s 1,349 top 10 rankings for keywords containing the phrases “car hire” and “car rental,” from Ahrefs Site Explorer. Take note of the pages that are ranking. They are all location‐specific landing pages. So this is clearly the way to go if you want to rank in multiple locations. Don’t go crazy with location‐specific landing pages unless you have an actual physical presence (office) in each of those locations. 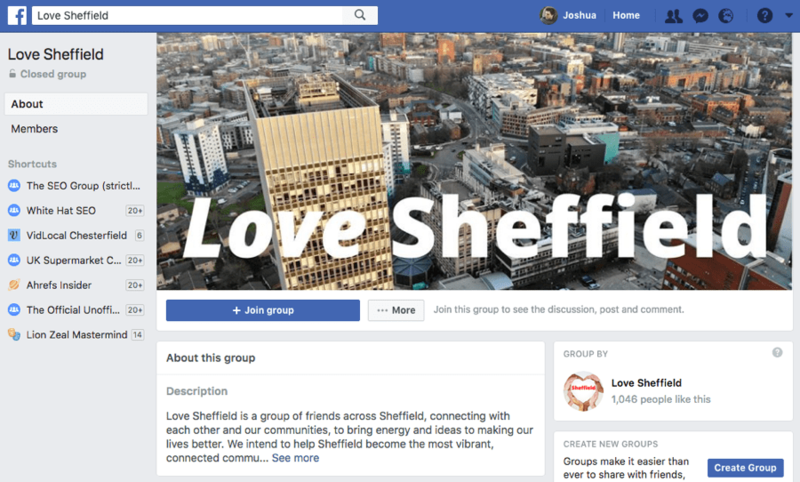 For example, if you’re a Sheffield‐based wedding photographer (meaning your GMB listing address is in Sheffield), don’t create hundreds or thousands of local landing pages for every town/city/county under the sun. Don’t make local landing pages for faraway locations unless you have a specific reason to do so (e.g., you’re based in Sheffield, but genuinely specialise in Maltese weddings). Also, DON’T create multiple landing pages for the same location, but targeting slightly different terms. This will not help you to rank. Let’s see if they rank for their target terms, shall we? Looks like the site ranks in position #2 for all of these terms. But look at the page that ranks—it’s the homepage, not the landing pages. Basically, Google has made the decision that it’s the homepage that should rank here, rather than the individual landing pages. So, no harm done, right? Not quite. The downside of this is that so‐called “link equity” is unnecessarily distributed across multiple pages. In plain English, this means that the homepage could be stronger and potentially rank higher. Bottomline? This is bad practice and you should avoid doing it. Most businesses should optimize their homepage around their primary location. 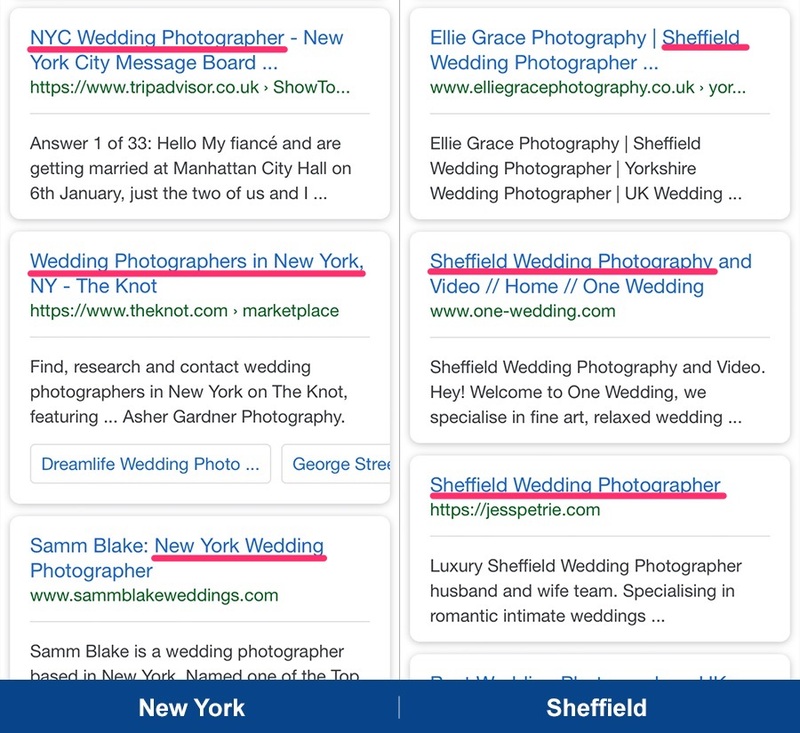 For example, a Sheffield‐based wedding photographer should optimize their homepage for terms like “sheffield wedding photographer” etc. Fair point. So you should leave out the location references and just optimize for “wedding photographer”, right? After all, that has 45x more monthly searches. Google “wedding photographer” and I guarantee that most of the results will be location‐specific. Despite not adding a location modifier to your search, Google still shows localized results. This is because they’re able to infer your location from things like GPS (on mobile), your IP, etc. They know where you are, so they effectively just add the local modifier for you in the background. So, you may as well optimize your homepage for your location. Your local landing pages should be optimized around individual locations. Schema really isn’t that complicated. It’s just some additional code that gives Google additional information about your business/website, and helps them to better understand the data being displayed on your website. You don’t have to be a technical wizard to implement it either. Google’s Structured Markup Helper does most of the work for you. Your page will load in a visual editor. Adding schema.org markup is as simple as right‐clicking any appropriate on‐page elements and choosing relevant markup items from a list. It’s also required that you add an image. So right‐click your business logo and choose image. You can also add markup for opening hours and a bunch of other stuff. 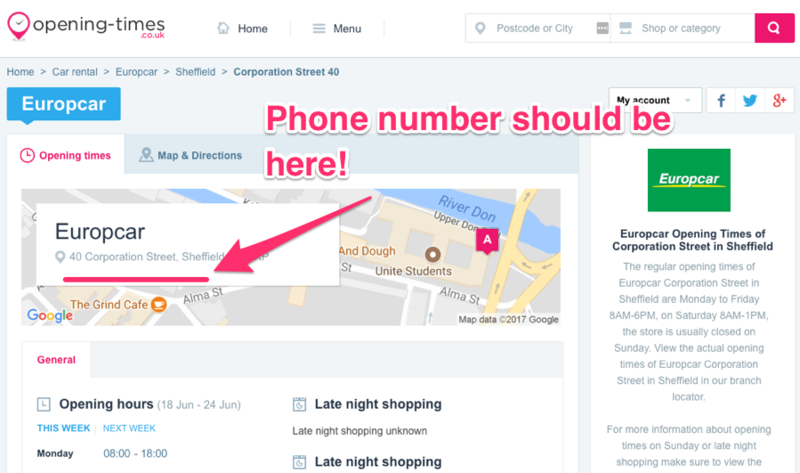 If you want to add cell/mobile numbers, just use the telephone markup twice—this is perfectly ok to do. Just remember that all of this data should match up as closely as possible with your Google My Business data. When you’re done, hit “create HTML” and select the JSON‐LD format. 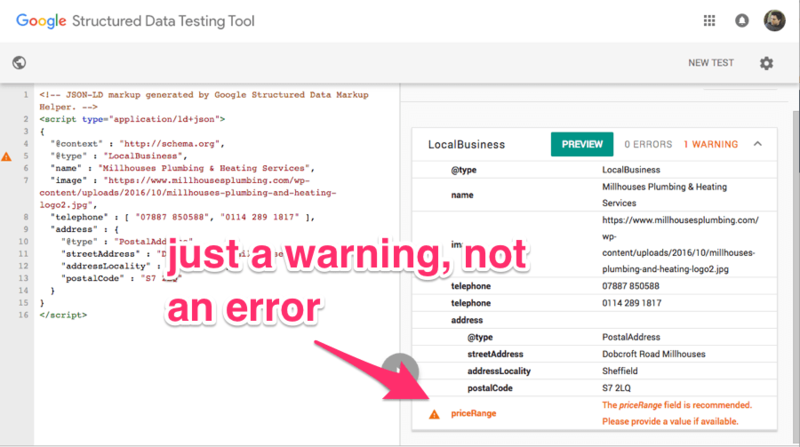 You can then test the code using Google’s Structured Data Testing tool. Just paste it in and it will highlight any errors. Fix any errors, then paste the code into the header section of your website. 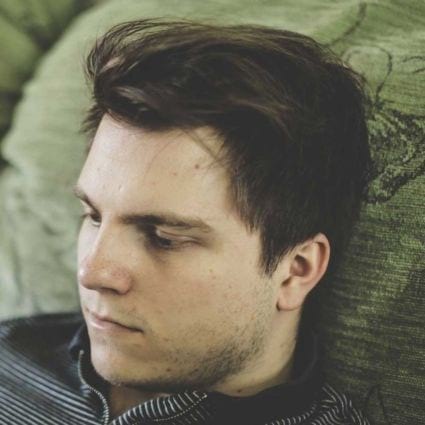 SchemaApp is another useful tool for implementing schema markup on your site. It integrates with Google Tag Manager (and other existing platforms—Shopify, Drupal, etc. ), which means you can add/edit markup without messing around with code. If you have multiple physical locations (different addresses, phone numbers, etc. ), you will need to follow this entire process for each and every local landing page. According to Moz’s 2017 survey, “link signals” are the most important ranking factor for local organic results. For the local “snack pack,” they’re the second most important factor. But unfortunately, many of these will be nofollow. Nothing will help you to win over potential customers more genuinely helping them. Let’s assume you’re a plumber in Sheffield, UK. Your target market is Sheffield folk. What kind of resource would be genuinely useful to those people AND likely to attract links? A Guide to Plant Care (for Sheffield Folk)—Up here in t’North of England, our water is soft. But did you know that soft water isn’t great for plants? I didn’t, but now I’m wondering if this is the reason my basil plant always dies. It isn’t totally plumbing‐related, but I’m sure a guide to plant care for Sheffielders would be both eye‐opening and useful. How to Unblock a Drain with Henderson’s Relish and Baking Soda—OK, this is a bit of a silly one. I found this video via Content Explorer, which talks about unblocking a drain using vinegar and baking soda. With Henderson’s Relish being produced in Sheffield—and tasting just like vinegar, according to my taste buds—I’m wondering if this might have the same effect. If so, this could (maybe) make a great piece of linkbait. I’m not saying those ideas are great (they are just off the top of my head), but hopefully you get the idea. Local “best of” guides—Create a list of the best restaurants, bars, breweries, attractions, things to do, etc. in the area. Local calendars—Create a local calendar, featuring the most notable events across numerous categories occuring in the next few months. Once created, it’s just a case of promoting it. Facebook groups like this are a great place to start. Just make sure to clear it with the admins first! Guest blogging is still a great way to build high‐quality links. Just don’t do it solely for the links. Do it for the exposure it can generate for your business. In 2018, it’s more about quality than quantity—you should be writing for blogs that have the potential to send targeted referral traffic to your website. 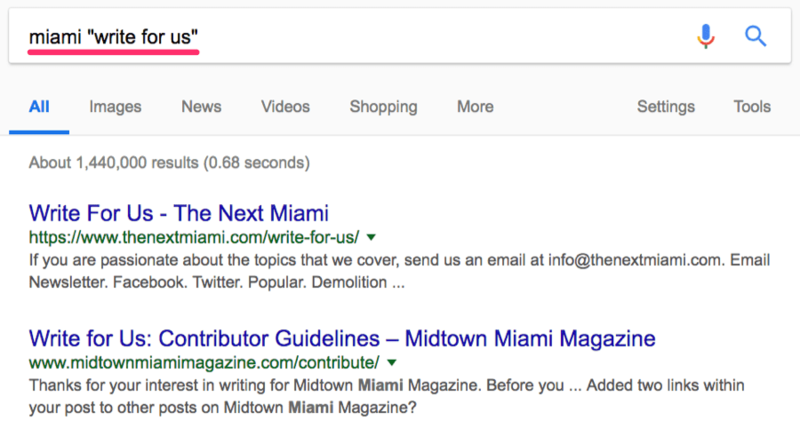 You can also do the same to find industry publications—just replace the location with a keyword (e.g.. “plumbing” instead of “miami”). Similar searches can also be done in Ahrefs Content Explorer. Looking for plumbing‐related guest post opportunities in Ahrefs Content Explorer. Here’s a page I found via Content Explorer about preventing freezing pipes. It’s 482 words long and has 116 referring domains. 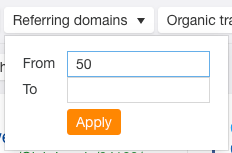 Use the referring domains filter in Content Explorer to filter for pages with lots of backlinks. Having looked closer at the backlinks in Site Explorer, there are some good links too. It would be super‐easy to create a better guide to frozen pipe prevention and steal links from this page. Link Intersect is useful for more than just building citations. 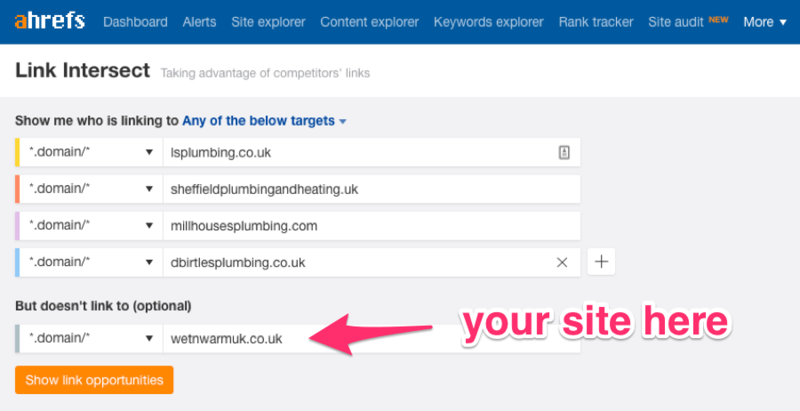 It’s best to do with the top‐ranking sites for your target terms (e.g., Sheffield plumber), as this should uncover needle‐moving links. Nine times out of 10, this will uncover a lot of directory links. This isn’t a bad thing—it’s a good way to discover more NAP citation and nofollow link opportunities. But it will also uncover forum links, guest posts, and other unique types of links. Links like these are easily‐replicable. 5.5. Even MORE Link Building Tactics! It would be impossible to cover every link building technique in this article. Having a “set it, and forget it” mentality is the worst thing you can do when it comes to SEO. Local SEO is no different. As such, there are a few ongoing activities you should keep in mind. No.1 is pretty self-explanatory—just keep track of and respond to reviews (positive and negative) in a timely fashion via Google My Business. You should do the same for any other review sites that are crucial for your business (e.g., TripAdvisor, for restaurants). But you also need to keep a look out for incorrect edits to your listing. Basically, anyone can suggest an edit to any Google listing with the “Suggest an edit” button. Google seemingly implements a lot of suggested changes without notifying the business owner or validating the information. So it’s worth giving this a quick check once every couple of weeks to make sure everything is still accurate. Google Posts is a micro‐blogging platform within Google My Business. All updates are visible in the Knowledge Panel and on your listing. Not only does this increase your SERP real estate, but it provides an opportunity to attract more attention and boost conversions. Some studies (here, and here) even show a correlation between “snack pack” rankings and Google Posts activity. 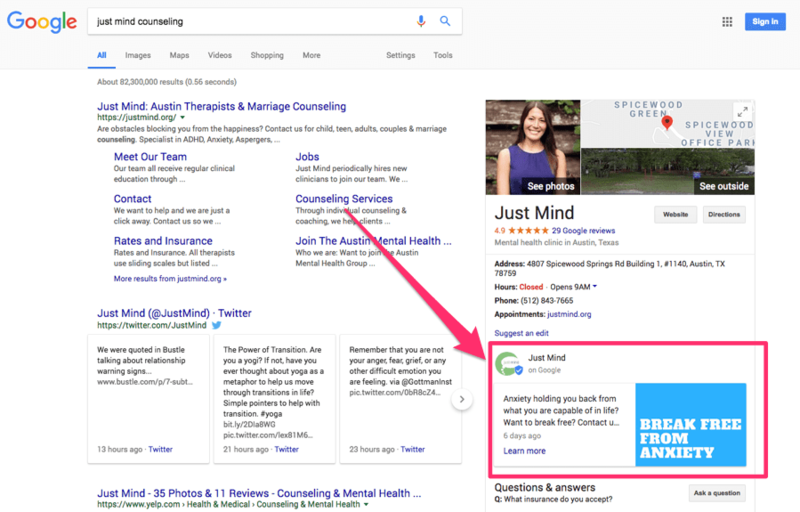 You can create a Google Post from within Google My Business. You can also choose the call‐to‐action button (“Learn more,” “Sign Up,” “Get Offer”, etc.) to include on your post. I recommend all local businesses play around with this feature and stay active with Google Posts. It doesn’t take much time or effort to do, so ROI will likely be high. But don’t blog just for the sake of it—go for quality over quantity. Just publishing a new post every month or two will be enough for most small businesses. I’m not going to go any deeper on this point as we already have a ton of resources related to blogging on the Ahrefs blog. I’ve included some further reading links below. I’m know that’s a lot to take in but, seriously, follow the advice above and I guarantee you’ll be ranking better than 99% of your competitors. Just remember that you also need to track conversions as best you can (call tracking, contact form conversion tracking, etc.). Otherwise, you will have no clue if your local SEO efforts are actually translating into leads, customers, and ultimately, more revenue for your business. Did I miss anything in this guide? Let me know in the comments.